GRANTS PASS, Ore. - The Oregon Department of Fish and Wildlife has expanded the area where it is killing sea birds to see if they are eating protected young salmon. Documents show the U.S. Fish and Wildlife Service has allowed Oregon to expand a study started last year into how many salmon cormorants are eating from the Tillamook estuary into the Umpqua and Rogue estuaries. The department can shoot 50 cormorants a year on each of the estuaries, through March 2015. Under pressure from sport fishing groups, the department last year asked for permission to reduce the number of cormorants eating young salmon on the Oregon Coast by 10 percent. But the federal agency denied that request until the department gets hard data showing it would help the recovery of threatened coho salmon, not just salmon in general. Department spokesman Rick Swart said Monday that the first cormorant was shot on the Umpqua estuary last week. 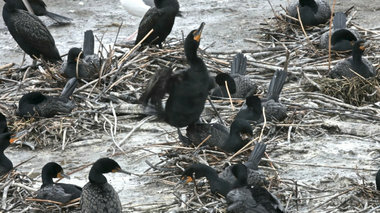 About 4,000 cormorants nest on the Oregon Coast at the Tillamook, Umpqua and Rogue estuaries. It's the latest case of wildlife officers killing one federally protected species to help a threatened or endangered species. Cormorants are protected by the Migratory Bird Treaty Act. For years, the department has killed sea lions, protected by the Marine Mammal Act, that eat threatened and endangered salmon at Bonneville Dam on the Columbia River. Similar studies have found cormorants at the mouth of the Columbia River eat 15 percent of the millions of young salmon and steelhead migrating to the ocean. Volunteers have been chasing cormorants with boats and firecrackers to reduce the number of salmon they eat. Swart said department personnel do the shooting and check the birds' stomachs. If the contents are not clearly salmon, they are sent to a lab at Oregon State University for identification, and sometimes DNA analysis. Once considered a nuisance bird, cormorants were added to the Migratory Bird Treaty Act in 1972, the same year the pesticide DDT was banned. Current estimates are that about 70,000 cormorants live in the West between southern British Columbia, the Mexico border and the Continental Divide. About 27,000 are on Sand Island at the mouth of the Columbia River. Swart said biologists have noticed a decline in cormorant numbers on the Oregon coast that seems to be related to an increase in bald eagles, their only feathered predator.